Im using this code to make based on log2foldchange and padj value ,im getting the plot but i want those value for my reference how do i extract the same . is that suffice and am i doing it correctly ? 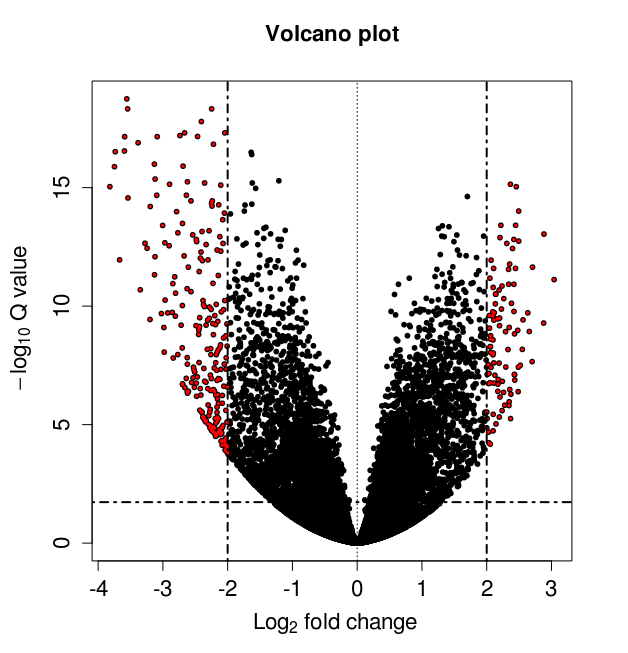 There is an even better solution that I and colleagues developed using ggplot2, which allows you to easily fit labels into your plot using ggrepel(). Glad to have helped. Note the particular use of the bquote() function in order to get super- and sub-script. These are small modifications but can make a plot feel more professional. 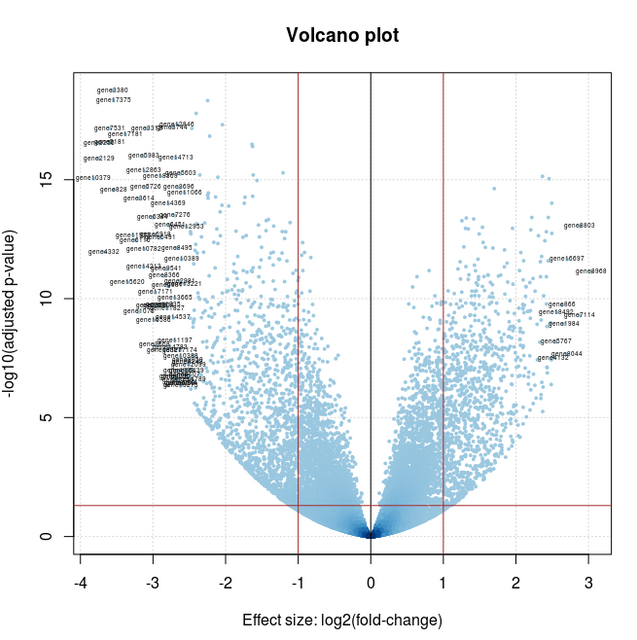 bquote() also works with ggplot2 (here I've used it with base functions). Can you paste your code so that I can put this in context? Yes, the last two lines contradict each other, specifically padj<0.05 & abs(lfc)>=0.58) and padj<0.05 & abs(lfc)>=-0.59). I am wondering if you have rscript showing the upreguted and down regulated? Can you share them? In which program did you conduct differential expression? I used edgeR in getting my DE. Once I got them, I pre-filtered my DE list in excel. I only extract FDR<1e-5 which is my significant. Then from those list, my up-reg is log2FC>0 while my down is log2FC<0. I wanted to plot my FDR against log2FC. Can you embed the script here? Thank you very much! toptable$Significance[(abs(toptable$logFC) > FCCutoff)] <- "FC"
toptable$Significance[(toptable$FDR<AdjustedCutoff) & (abs(toptable$logFC)>FCCutoff)] <- "FC_FDR"
How to determine which SNPs are above FDR line?